Bobby is using Smore newsletters to spread the word online. Robie is an experienced traveler. She’s taken the flight from Honolulu to the Midway Atoll, a group of Pacific islands where her parents live, many times. When she has to get to Midway in a hurry after a visit with her aunt in Hawaii, she gets on the next cargo flight at the last minute. She knows the pilot, but on this flight, there’s a new co-pilot named Max. All systems are go until a storm hits during the flight. The only passenger, Robie doesn’t panic until the engine suddenly cuts out and Max shouts at her to put on a life jacket. They are over miles of Pacific Ocean. 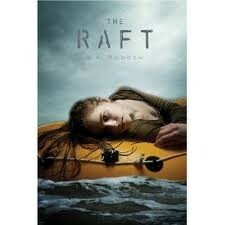 She sees Max struggle with a raft. And then . . . she’s in the water. Fighting for her life. Max pulls her onto the raft, and that’s when the real terror begins. They have no water. Their only food is a bag of Skittles. There are sharks. There is an island. But there’s no sign of help on the way. S.A. Bodeen is the author of The Compound, which earned her an ALA Quick Pick for Young Adults, a Bank Street Best Children's Book of the Year, and a Publishers Weekly "Flying Start." She is also the author of several picture books, including Elizabeti's Doll, winner of the Ezra Jack Keats Award.Bodeen grew up on a dairy farm in Wisconsin. Her first friends were cows, which she named after characters in books. From there she went on to be a Peace Corps volunteer in East Africa, and has lived in seven states, as well as a remote Pacific island. She adores books and is a big fan of cheese. You should read this book because it is full of suspense and fully packed of action. It has something happening every second of the book.